True stories are always an inspiration in one way or the other. They have some incidents in it which make you realize the importance of a lot of things in life. Author Sudeep Nagarkar in his latest book "Sorry, You're Not My Type" has taken story writing to a new level. So has he been able to do complete justice to the story? Let's find out. All relationships should come with a precautionary warning: Handle with care. The final audition for Rajhans Colleges prestigious music band brings together three contrasting personalities. Vikrant, a perfectionist, who believes there is only one perfect someone for you. Anamika, a free spirit, who stands up for what she believes is right. Yuvi, a die-hard music lover, who can strum the guitar all night long and still wake up the next morning to drop off his girlfriend. The three become close friends and start hanging out regularly. So how does Aditya, a stranger, become a part of their lives? And what happens next? 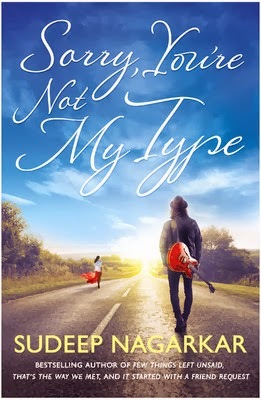 Sorry, You're Not My Type is a true story that will redefine friendship, affection and infatuation. First look at the title and the cover and the readers will feel mesmerized with it. A perfect romantic set up with a beautiful cover image and a simple yet eye catching title makes it all the more curious for the readers. The blurb talks about a few virtues of a human life and how they matter to some people in the story. The shorter the sweeter goes well for the blurb. The facts concealed well and the hints again taunting the readers to go through the book in order to get the hang of it. The story is of VAYU a very famous band of Rajhans College and it's members Vikrant, Anamika & Yuvi. All of them share a similar passion i.e music which brings them together and a bond of friendship develops with time. Their personal lives take a hit too as Vikrant & Anamika get attracted to Anurag & Sanaya and its upto them to handle it from there. But things are not that rosy as a lot of incidents and unpleasant exchanges betweeen Yuvi & Anamika creates a rift. So will Vikrant be able to hold VAYU together? Will they be able to achieve their dream? What role will love and attraction play in the lives of the trio? That's what the story is all about. The beauty of the story lies in the fact that it's simple yet heart capturing. The poetic verses are in tune with the whole setup. The virtues and relationships and behavior of three people with different mindsets leaves you spellbound at the end of the story. The fluid narration with some mind boggling events in between the story will leave the readers dazed for sometime. The book is a lesson in itself and has a lot to offer when it comes to emotions, drama and love. The ease of making things look real in the book is another USP of the book. There is no downside in the book. The enthralling nature of the book will keep the readers busy till the end. There is no looking back once the story starts and moves forward. It'll make you travel with it and experience times which are truly part of everybody's life. There are highs and lows which will grip the readers and sometimes shudder them and sometimes give a lot of joy. There's no dull moment in the book. It's a book to be felt with complete heart and soul. A perfect stroke by the author. hi your reviews are great.Was wondering if you buy all the books or there is some other provision. Hii...you give a perfect review of a book and when I have to buy or select a book to read I always search for reviews written by you and I liked the story written by you and Heena Ahuja in Uff Yeh Emotion 2 it is awesome... it express the right feelings and emotions of an Old man who had been left alone by his own kids in an old age home ..
Hi Shivangi. :).. Thanks a lot for all the appreciation. :).. Thanks for liking our story too in UYE-2. I hope the reviews help you in making good choices and not miss out on some good books. :). Cheers.